Optimum Safety is a full-service security company that provides comprehensive security services for clients in all lines of business and residential facilities in Ontario. We offer a variety of services that include but are not limited to professional security guards, mobile patrol, alarm response, integrated security systems, fire watch, event security, alarm monitoring and more. Recognized as a significant and professional security company serving the province of Ontario, Optimum Security strives to provide the highest of security services at affordable pricing. We discuss with our clients, analyze all possible risks in any given situation and create a security program suited to meet their needs and demands. Optimum Security deploys fully screened and highly trained security guards who are thoroughly experienced in evaluating risks and making appropriate recommendations to improve safety. 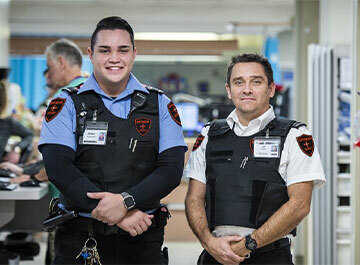 Our on-site security guards are uniformed to maintain high levels of visibility and authority. They have gone through extensive training to ensure they are prepared to handle whatever comes their way while on duty. We also provide mobile security and foot patrol officers to monitor entrances and exits and establish a presence of safety and authority around your compound. It takes highly trained security professionals who understand what it takes to get the job done right to keep business assets, properties, people, and crowds safe. Our security team is very much involved in providing professional solutions to clients utilizing comprehensive know-how and revolutionary technologies. We offer a range of alarm and integrated security systems and have the resources and capacity to respond to triggered alarms at a moment’s notice. We can help you choose the best home security monitoring service that can offer you protection and peace of mind. At Optimum Security, we do much more than providing security as we firmly believe that a good security company should give exceptional customer service as well for maximum client satisfaction. Contact us today or fill our online form to learn about our security solutions and how you can better protect the people and properties you care about. We are here to help you determine what will best suit your Ontario security needs.